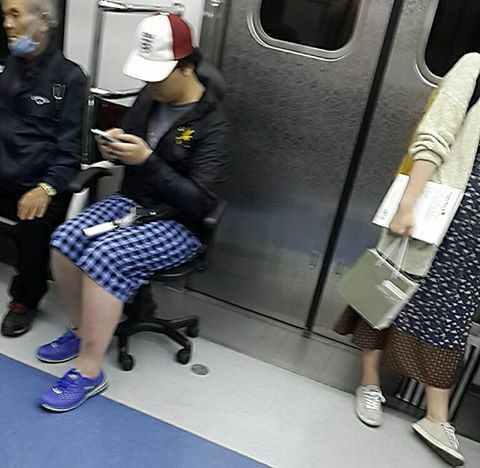 Spotted somewhere near Seoul – proven way to be guaranteed a seat! Brilliant! This entry was posted in Silliness and tagged chair, chairs, crazy, fun, funny, genius, giggle, giggles, hilarious, humor, humorous, humour, humourous, korea, korean, Koreans, lmao, lol, odd, off, rofl, Seoul, silliness, silly, so funny, south korea, subway, subway seats, train, transport, wacky, weird. Bookmark the permalink. Strong thigh muscles keeping him locked in place! haha! That’s a good workout then! I’ve got to try that!